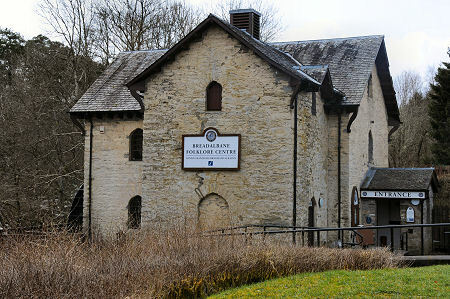 The Breadalbane Folklore Centre closed in 2011, and later became an arts and crafts shop. We understand, however, that it may have reopened and are trying to clarify the current position. For the moment the rest of this page remains as written before the initial closure. The Breadalbane Folklore Centre stands towards the south western end of the long village of Killin. 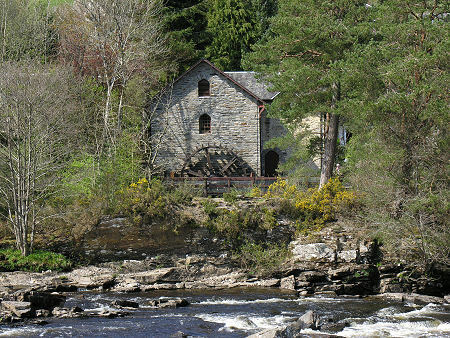 It occupies what was built in 1840 as St Fillan's Mill, designed to harness the power of the River Dochart as it tumbles down the Falls of Dochart. The Folklore Centre also stands at the northern end of the Bridge of Dochart, built in 1760 and partially rebuilt after flood damage in 1831. Intending visitors are recommended to park in Killin itself and walk back to the visitor centre. The mill was restored and converted for use as a visitor centre in 1994, and today offers visitors three floors which between them set out some of the background of the area as well as offering opportunities for a little retail therapy. 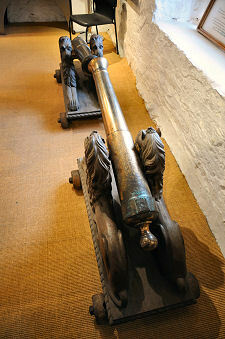 As it is an old building, access has not been possible above the ground floor for anyone unable to tackle the stairs. The first point of interest is the wooden terracing which extends round the side and rear of the centre. This allows a close-up view of the waterwheel in operation. 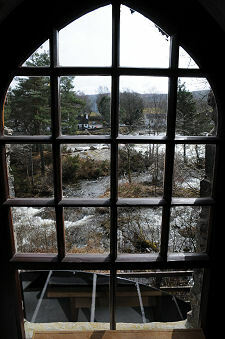 It is also a good spot from which to look across the Falls of Dochart. The working water wheel on the outside of the centre finds its echo in the mill machinery which still exists on the ground floor of the interior. This no longer does anything more than look impressive and remind you of the origins of the building: this is after all no longer a working mill. Also on the ground floor you find Killin's tourist information centre, and a wide range of gifts, books and maps. The first floor of the centre carries a series of exhibitions which focus on the story of the clans of Breadalbane and the story of the folklore of the area. This might be a good moment to explain that Breadalbane is a name derived from the Gaelic for High Country of Scotland and, although it tends to be used slightly differently by differently people and for different purposes, is usually taken to mean a swathe of the highlands extending from west of Tyndrum to east of Aberfeldy, and including Killin, Glen Lyon and Balquhidder. As such it includes parts of the areas of Argyll, Stirling, Perthshire and Highland. A different part of the first floor of the centre is given over to each of the clans who, at different times, were closely associated with Breadalbane. The MacNabs were for many centuries in control of the area, and one cabinet is home to a collection of the belongings of their 16th Clan Chief, Francis McNab. Elsewhere the McGregor Clan display has on show what some believe to be Rob Roy MacGregor's sword. This has been shown to be a genuine claymore dating from the 1600s, and was passed down through generations of McGregors before its then owners emigrated in the 1800s. It was returned to Scotland in 2006 and presented to the centre by the family of the late Mrs Lottie Kate McGregor. The second floor is home to the story of St Fillan, an Irish missionary who in the 700s, it is said, converted many of the Picts of the area to Christianity. His story is told through a number of information panels and exhibits such as replicas of his quigrich (the head of his pastoral staff) and bell, but primarily by means of a sound and light display in the otherwise largely dark end of the upper floor. See note at head of text.